Several new mega-resorts have been built in Orlando over the past few years, so you would think that it may be difficult to pick the one offering the best value for the money. Re-visiting the Hyatt Regency Grand Cypress reminded us that a quality resort built several years ago can still offer exceptional deals to those that value a first class experience. The Hyatt Regency Grand Cypress was the first of its kind in Orlando - a mega resort targeting the convention market as well as the families wanting a leisure vacation. Even 20 years later, the resort still delivers. The 18-story building is built in a pyramid shape that overlooks 1,500 acres of both busy activities and peaceful, natural environments. All 750 guest rooms have a small walk-out balcony and spectacular views of the grounds. Entering the Grand Cypress is an experience. Guests are greeted by a 200-foot atrium lobby adorned with lush tropical foliage. Interpersed throughout the very aesthetically pleasing public areas are more than $1 million in original works of art including sculptures, artifacts, and paintings. 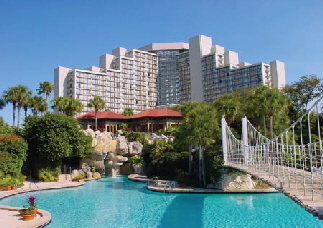 Exploring the entire resort and lush surroundings can take a few hours, but most guests start with the resort's centerpiece: a half-acre free form pool with 12 waterfalls, two waterslides, swinging rope bridge, several large lagoon shaped sections, interconnected still-river areas and three whirlpools. One part of the interconnected pool allows guest to swim or "power-walk" through giant rock Grotto "caves" that are covered with flora. What a great way to take a break from the sunny side! The pool is definitely the center of a variety of recreation activities. Adjacent to the pool is a serene, 21-acre lake and a white sand beach. Enjoy exploring the lake with a paddle boat, kayak or canoe and experience true peace and quiet just a few feet away from the resort's shore. Adjacent to the pool area is a beach fire pit for toasting s'mores in the evening and a spa and 24-hour fitness center in the Grotto area. Other nearby activities available are a nine-hole par-3 pitch and putt course which is deceivingly challenging (clubs and balls are provided), a fitness trail and a nature area with elevated boardwalks and descriptive signs leading visitors into 45 acres of natural Florida terrain preserved in cooperation with the Florida Audubon Society. Guest can take bicycles and even four passengers surrey-type bikes along a path surrounding the resort. Just a few minutes away, the resort's free shuttles can drop you off at their equestrian center, racquet club, or riding stables where the entire family can enjoy a one-hour western trail ride. Once again, it's hard to imagine you are just a mile or two from one of the country's busiest attraction areas. For most visitors to Central Florida, golf is a must (click here to see separate articles on Grand Cypress Golf Club and the Grand Cypress Academy of Golf). The Hyatt Regency Grand Cypress is no exception. Just a couple of miles away, the Grand Cypress Golf Club offers resort guests 45 holes designed by Jack Nicklaus and home to many tournaments. The signature course is the New Course, designed after the Old Course at St. Andrews. Special packages make these courses very affordable in the shoulder and off seasons. Need an entertaining place to stash the kids for awhile? Available at nearly every Hyatt Resort, Camp Hyatt provides children age 5-12 with scheduled activities which are geared specifically to their age group and gives the adults a (welcome) opportunity to enjoy the resort on their own. If you stay at the Grand Cypress for several days you just might have the opportunity to try all the dining options available, but don't use the scales in the guest rooms if you do! The most popular and well-known restaurant is Hemingway's, inspired by Key West architecture and atmosphere overlooking the pool area. Here you can sample ceviche, crisp tempura dusted calamari, and scallop bake and then move onto Lobster Crusted Sea Bass, Seafood Paella, Beer Battered Coconut Shrimp and many other delicious dishes prepared by the expert award-winning chefs. Another dining option is the White Horse Sports Bar & Grill located just off the lobby, specializing in prime rib and, of course, sports. Cascade, open for dinner, feels like open-air dining due to beautiful two-story high windows overlooking the tropical foliage outside. 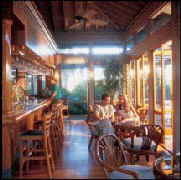 More casual outlets include the Palm Cafe, Trellises and La Coquina, known for its Sunday Brunch. As if the regular restaurants were not enough choices, a special Chef's Table at La Coquina is also available Thursday through Sundays. This unique culinary event invites guests into the award-winning kitchen to watch first hand (and even participate in) the preparation of a five-course gourmet meal. If you have not experienced a Chef's Table event, we highly recommend it. Reservations are required and space is limited. In a city where the latest and newest always seems to attract the most attention, there are a few landmarks that will always be at the top of the "first class" list for the savvy traveler. The Hyatt Regency Grand Cypress is definitely on that list, and we are certain it will remain on that list for many years to come. Note: There are several discount vacation packages available including a "Create Your Own Paradise Package" for guests with specific activities in mind. For more information and/or reservations, contact 1-800-55-HYATT or directly at 1-407-239-1234 or visit their website at www.hyattgrandcypress.com.